I will admit right here and now, I have a love/hate relationship with pork chops. I have an infamous track record of picking up perfectly innocent, juicy-looking pork chops at the market and then cooking the life out of them until they are drier than dry can be. However, the Southern husband is a big pork chop fan, so he has faithfully stayed by my side, eating dry pork chop after dry pork chop, waiting for the day that I will figure out how to make the tender, juicy pork chop of his dreams. Well, wait no longer, love of my life…oh happy pork chop day! So why did this recipe for smothered pork chops work for me after all this time? Two reasons, I’m thinking. First, it finally dawned on my that it might be helpful if I used my handy dandy food thermometer to actually tell me when the pork chops were done. Not overdone, but actually just at the peak of done. Which is 145 degrees, by the way, and if you don’t have an instant read thermometer, you need one. It’s handy for so many things. I have this one, which comes with its own little case and has the temperatures for all kinds of things on the side of it. After the pork chops had cooked for their allotted amount of time, I popped the thermometer in, and when it said 145 I was brave enough to take the pork chops out of the pan rather than cooking them for another few minutes Just To Be Safe. And the other reason we love this? The scrumptious sauce, which is a delectable mixture of the pan drippings simmered up with chicken broth, buttermilk, a little flour and a swirl of butter at the end to add a little silkiness. 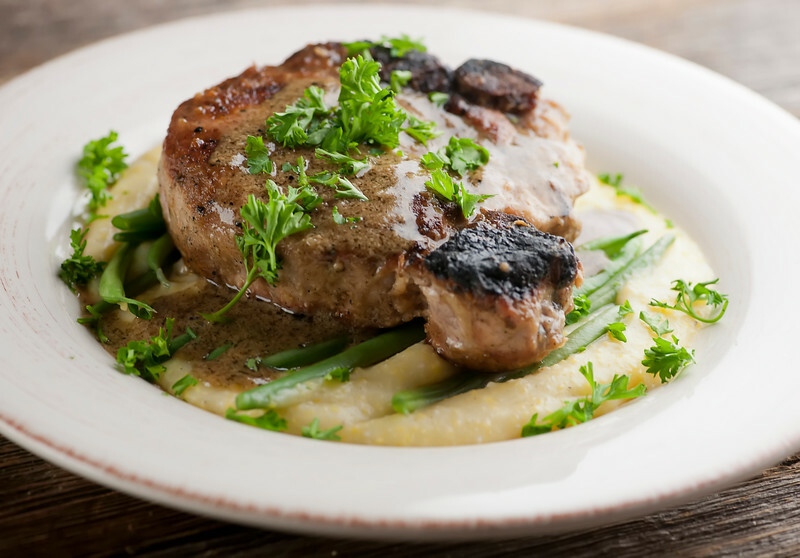 Lay your perfectly cooked pork chop in a bed of grits and green beans, smother it with some of this sauce, and every overcooked pork chop you have ever made will instantly vanish from your memory! …you just have to wake them up first! The key to super tender pork chops is as easy as an instant read thermometer…try it for yourself with this recipe for smothered pork chops! Whisk salt and pepper into flour and place on a large dish. Dredge the chops in the flour mixture, saving the flour to use later. Heat the oil into a heavy large skillet over medium high heat. Cook the chops for 4 minutes per side or until an instant read thermometer reads 145 degrees (start checking after 3 minutes on the second side). Remove the chops to a plate. Whisk a tablespoon of the flour mixture into the pan drippings. Whisk in the chicken broth and 1/2 cup of the buttermilk and simmer for 3 minutes or so. Whisk in the rest of the buttermilk, another tablespoon of flour and the butter. Simmer until the butter is melted and everything is well combined. Return the chops to the pan and turn them over a few times with tongs until they are warmed up and coated with sauce. Serve the chops with a generous pouring of pan sauce. 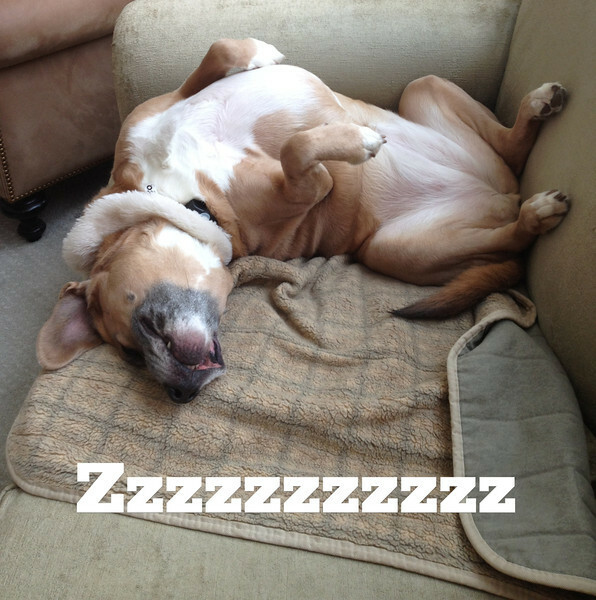 Don’t know what made me happier – these gorgeous pork chops or that sleeping dog! Looks delicious! I’ve never cooked pork chops before but actually just bought some last weekend. Now I know what to make with them (and to not let them get dry! )- thanks!